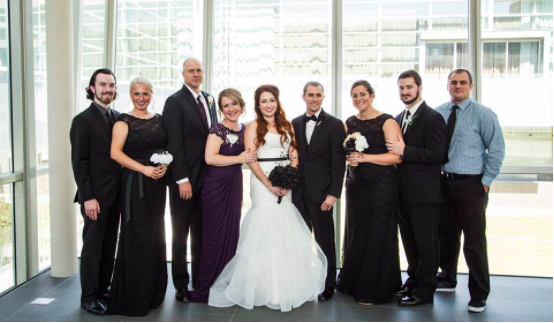 Michelle Baldwin is a Lead Teacher at Anastasis Academy in Centennial, Colorado. 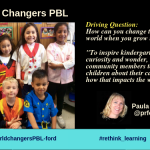 She believes in inspiring students to follow their natural curiosity and take ownership of their learning through inquiry, problem-based and experiential learning, and the Arts. Can you share your background and your family? I was born and lived in Omaha, Nebraska. I went into teaching as a 7-12 music educator for six years, then I started to lose my voice and didn’t have enough opportunities to see my children. Being a music educator is time intensive, and I found myself at the school all the time. I decided I wanted to see my children grow up too. I went into the corporate world for a while and did some technology training and that’s where I got into all that techie thing. I remember thinking around 2000-2001 that there was so much potential for education. After that, I went into technology staff development and helped teachers use technology in their classrooms. Then it wasn’t long before I missed kids and needed to get back into the classroom. I taught elementary music for a couple of years. At that time (2009-2011), three of our four kids had already graduated high school. All four of our children are now in their mid-twenties. We are expecting a grandchild in December. Three of our children are still in Nebraska; two are in Omaha and the other in Lincoln. Our youngest daughter is in Lenexa, Kansas (works in Overland Park). 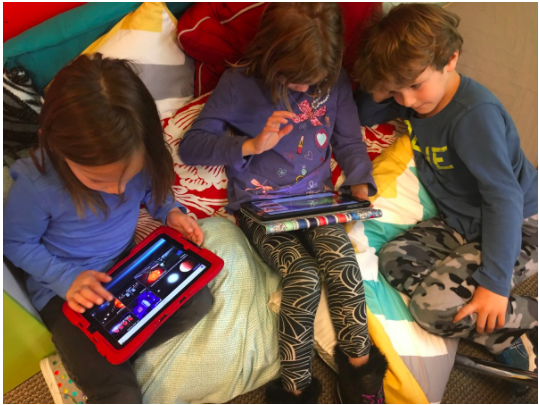 Then, my wonderful friend, Kelly Tenkeley said: “I think I would like to start a school.” She explained school is starting to take the joy out of learning and how kids are so naturally curious when they come to us. After being in school, they are just going through the motions. So we talked back and forth for a while and I said, “if you build it, I will come.” She did and my husband said, let’s move to Colorado. Colorado is beautiful so it was not a hardship to move here. Even though our children are not here, we aren’t that far away and visit them often. What is the background and philosophy of Anastasis Academy? Kelly started the school August 2011. We really wanted to start with that piece of each child where you know every kids’ name. Kelly has written many blog posts how she came to think how we would design the school, how she wanted to have it run on a daily basis. It starts with the kids. We don’t do grade levels so we have mixed-age classrooms. The way that we place the children with a teacher is based on where they are social, emotionally, and academically and their peers are. The way that I do it that I have 5 to 7-year-olds. The next class there are 7 to 10-year-olds and so on. We are a K-8 school with five-year-olds up to fourteen-year-old kids. We have a lot of overlap age-wise in classes throughout the school. That’s a big change for a lot of kids. We don’t do homework. Everything kids need to do they do during the school day. We honor the time they have with families and the learning that happens outside of the school. We don’t need to monopolize that time. That again is something different for kids. We are a 1:1 iPad and BYOD school so we have kids who bring in their laptop or whatever device the kids need for the tasks. 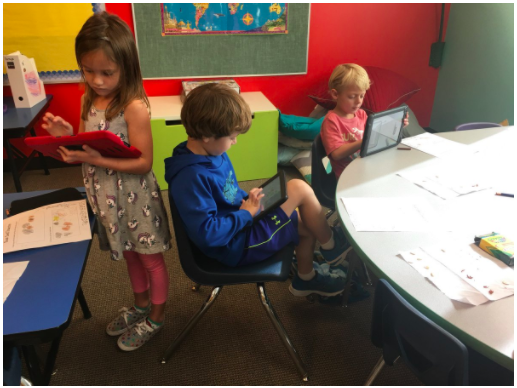 Using @seesaw to document our learning about the bean seeds. How do you build the culture and help kids develop the structures? We call it from day one the first week or month our detox time. 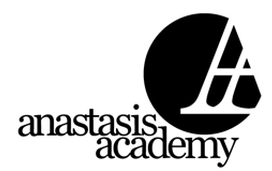 Someone pointed out that the initials for Anastasis Academy is AA so maybe we need to rethink that. [laughter] We do take that time especially for kids that come from other schools. We start right away to build the community and have lunch together every day. This is a faith-based private school so kids are looking at the world view a little differently. They all come together in a way that the kids will tell you really feels like family. So they start to get used to that these people care about me and my behavior. But, on the other part of that, we have a lot of freedom and independence in our school where we help kids manage those freedoms. There are natural consequences when things don’t get done. They have a lot of decision making on what they are to do to learn. In other schools, those decisions tend to be made for them. We have a structured environment; it’s just a different structure. We help the kids to build their own structures for them. How do you get to know your kids? Our very first thing we do every school year is to start learner profiles. That involves the kids meeting one-on-one with the teacher and we ask them what they are interested in, what is a struggle for them, what they think they are really good at favorite books and movies. We just sit and have a conversation. It is great to get to know the kids that way before they come to the classroom. We ask them what are their favorite ways to learn? Kelly devised a card game that they have to play that takes them through different learning preferences, styles, and brain dominance. We don’t use the results to teach them a specific way to being a visual learner. It’s more about the information we get about the kids. It’s really fun to have the conversations around who the kids think they are. When we first started Anastasis Academy, I taught 8, 9, and 10-year-olds. The 3rd or 4th year in, I moved to the youngest kids in the school. It’s really interesting to hear the different kinds of answers I get to questions. My favorite question is: “If there is one thing you could change about yourself, what would that be?” Most of our kids, especially the little guys, say that they wouldn’t change anything or they don’t know. They don’t have anything that they think is a flaw, deficit, or weakness. Which is awesome!! We build on that helping them to understand that you are great and continually develop who you are. That’s my favorite part of the whole year is getting to know the kids. What about kids that need additional support at the higher level? If we have kids that basically go through our model before they are ready to go on to the high school, we offer a capstone year as well. Last year we had two 13 and 14-year-old girls who did their capstone projects. This year we have one. They meet with the oldest classes we have and do a lot of independent work as well. They can have multiple projects throughout the year. Last year, the two girls were very passionate about the plight of refugees and how people view refugees. They wanted to make sure that our community understood and didn’t just hear misinformation about what a refugee is and who they are. So they had a ‘Come Meet People’ night along with a presentation, brought in people from different organizations, who were refugees themselves, and others who are working toward their citizenship. It was a great informational night, but the girls, through the whole project, raised money to donate to organizations. They see at 13 and 14 years old that they can make a difference by helping people become more informed and to show compassion about what people go through as refugees. This project helped them remember the humanity behind it. If we say who we really are, are we acting as we think we are? Those girls know that you don’t have to wait until you graduate from high school to make a definite difference in someones’ lives. Can you share Architects of Wonder and Team Baldwin? When I started that blog, Architects of Wonder, I was teaching the older kids, ages 8 to 11 years old. We needed a catchy name for our blog that described it well. One of my students named it from saying that we are “architects” building our own learning and because we are curious by asking and searching questions, we have that sense of wonder. We all agreed that was a perfect name that we started in 2012. I kept it going with the younger classes even when I moved to the older kids. Now I have 5, 6, and 7-year-olds keeping the blog going and people respond to them on Twitter on Team Baldwin. I told them that when you share what you are learning and thinking about, it does matter to other people. I told that there was an author who thanked them for reading her book. They started to realize that their learning matters outside of these four walls. That to me is super important because it is not just what we do at school, and what I do at home. 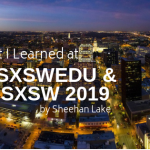 It’s now that learning is connected throughout wherever we are. Kids, especially the younger kids, go on photo shoots holding their iPads up taking pictures or videos where they become mini-documentarians. They are narrating everything that they see and capture. Last spring, kids took pictures of buds and narrated how they will turn into flowers or leaves. All of a sudden, they saw a hawk circling around and they all started recording the hawk narrating what they thought was happening. One little guy sounded like a sports commentator. It was okay for them to record something that wasn’t part of the objectives for the day. What is the difference between Learning vs. Teaching? I think for a long time, especially early on when formal education started in the US, it was about delivering information that you couldn’t gain anywhere else. So you had to memorize a lot of things and more about retaining content. The skills necessary for our kids is completely different. We have access to those facts. For so long we delivered content to kids. 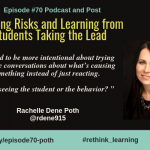 We know that if we gave a lecture, gave a worksheet, or a textbook to kids, and then they take a test that Friday, within a few weeks even if they got 100%, they might fail that same test. They are not retaining anything in their long-term memory because they haven’t experienced it in hands-on or as a real-world activity. Our kids have got to be able to direct their own learning. We are in blocks in our school where we take the International Baccaulareate themes and right now we are in the Who we are them. Some other themes are Place and Time and How the World Works. We still meet all the content areas but it all integrated. The kids are discovering things. I might share a video that could be an inquiry provocation. 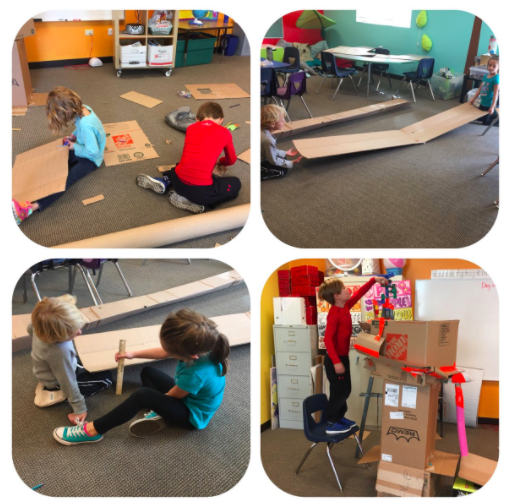 One example was when they viewed a BrainPop movie on space exploration that ended up with the kids wanting to build a model of the space station out of cardboard. Learning didn’t stop there. They wanted to learn everything about Scott Kelly who was on the space station and what it meant to be living on the space station. They then built their own space station and space module in Minecraft. It was incredible to watch this unfold. I didn’t deliver any of that information to them. That was two years ago. To this day, kids who participated in creating the space station can tell me more about space exploration than the average person on the street. They owned their learning because they were the ones wanted to keep going further and further about space exploration. It actually came from a debate on Twitter. Instead of arguing with anyone, I decided to write a blog post. Where in the debate could I think more deeply about motivation? For too long, we have kids that are incentivized to get through school like giving grades. By the way, Anastasis does not give grades. That fails because some kids don’t care about their grades. 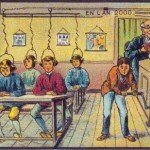 A grade as an incentive or punishment doesn’t work in the long run or tell the story of the whole kid. 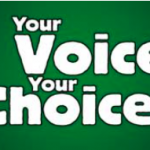 For me, motivation comes down to where’s the freedom in decision making and where are kids allowed to have a choice. When you watch a child working on something that she’s passionate about, she’s going to stay focused and engaged in the learning. My response to teachers who say that kids need to learn certain things is that you can give me any topic with kids of any age and incorporate those things into what kids choose to learn about. 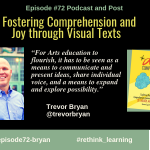 There is more in the conversation so I hope you listen to the whole podcast to hear how kids are motivated to use inquiry to bring creativity and joy in their learning. 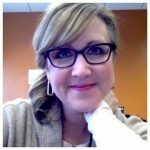 Michelle Baldwin is a Lead Teacher at Anastasis Academy in Centennial, Colorado. 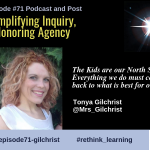 She believes in inspiring students to follow their natural curiosity and take ownership of their learning through inquiry, problem-based and experiential learning, and the Arts. 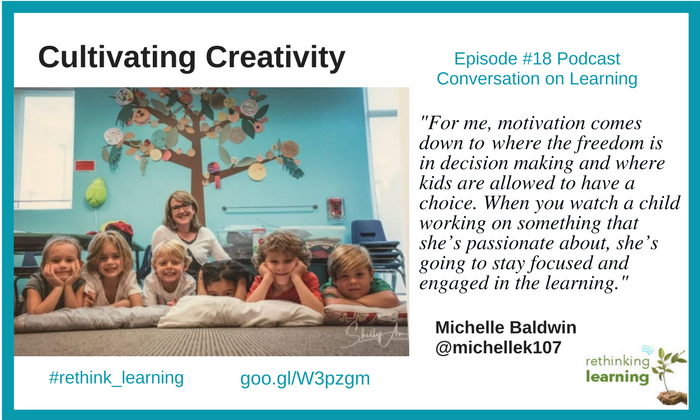 Michelle loves to share what students have taught her about the joys of learning, cultivating creativity, and connecting our learning with others.